A friend recently asked me how to create a treasury on Etsy. So I thought I would put together a little tutorial. Perhaps you already have an idea of a color theme, a song or something else that has inspired your desire to make a collection of items you like. If so, then getting started is easy. Another was to form a treasury is by regularly adding items to your favorites by hearting items you like. Still another idea would be to be working on several treasuries simultaneously by simply (I love this new button) adding an item to a treasury you have going- in this way you can work on several treasuries at the same time, adding items you like as you come across them. Once you have an inspiration, whether a theme or simply one item choosing content follows fast behind. 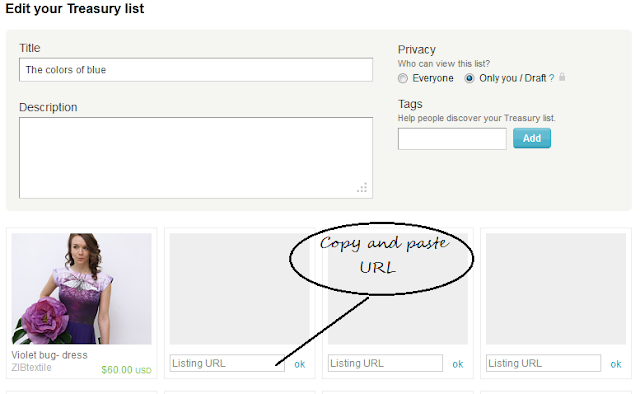 To begin you must go the treasury section: etsy.com/treasury and choose to Create a List. You can then begin adding content by copying and pasting the address URL link into the boxes and pushing ok (or just Enter) to add. To edit or remove use the buttons that are provided. Pro Tip! Be sure to keep your treasury private (only you/draft) until you are ready to make it known, otherwise it will become "old news" before you have even finished it. The date and time that will be listed are the date and time that you make it public. Another easy way to add items and work on several treasuries at the same time at your leisure is to add an item to a treasury directly. I love this new feature that I just discovered this week. I also love that it is automatically private this way and I don't have to worry about it going public until I change that setting. But how do you look for more items to fill up your treasury? You can do color searches and within that choose items that are from various categories. Be creative, using synonyms. If you are wanting to make a red treasury theme, use other words like: cherry red, garnet, scarlet, etc. Once you have everything ready, or even as you go be sure to add corresponding tags. If you are representing your team, or several teams where you included their items be sure to include those as tags (our Silk Artist team has a tag "silkartistteam" which you should include when making treasury including teammates). On treasury start page you can see Today's Trending Tags (on right side bar), check them out to see which tags are hot or trending more in this exact moment! This was a tutorial on how I do it since someone asked :) But I am sure there are lots of tips out there.